For the sauce: Dice 4 tomatoes. Combine with onions, lemon juice, salt, pepper, parsley and coriander. In a food processor or in a mortar and pestle, process remaining 2 tomatoes and add to the previous mixture. For the roast: In a stone mortar and pestle, add salt and peeled garlic. Process until you have a thick paste, add remaining ingredients. The sauce should be a little runny. Cover pork ribs with this sauce and place in a glass baking dish. Cover with aluminum foil and refrigerate for a few hours, preferably overnight. Bake for 45 minutes with aluminum foil. Remove foil, add a little hot water to the baking dish, and bake for another 20 minutes or until the meat is browned and tender. Let rest for 15 minutes and cut in thin slices. Serve with the sauce. The rustic sauce turns out much better when made in a stone mortar and pestle. Chancho a la Chilena is a rustic dish that’s usually made to celebrate Chile’s independence on September 18. It’s made with pork ribs or loin that’s marinated with a mixture made in a stone mortar and pestle so it can have a good consistency. 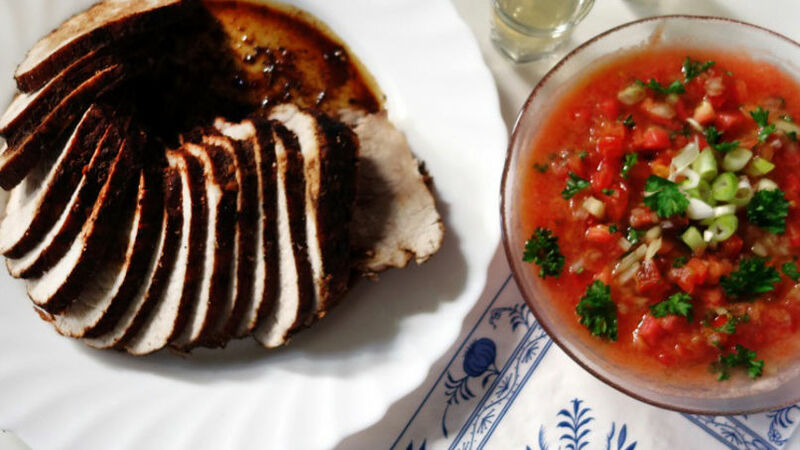 Then it is roasted or cooked on the grill, and it’s served with a traditional sauce called pebre. The pork is served in round slices with a side of papas panaderas, sopapillas–a delicious fried bread similar to Mexican buñuelos–with a serving of the ever-present sauce. Some make it with a variation of a chimichurri sauce.